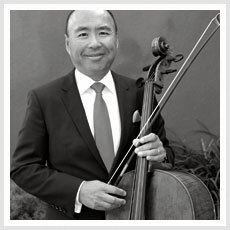 Cellist David Lin is a member of the cello section of The Santa Monica Symphony, under the direction of Guido Lamell. He is currently a student of Los Angeles Philharmonic cellist Barry Gold. David began his musical studies at the Royal Conservatory of Music in Toronto, Ontario, Canada. He studied piano under Patrick Li, chamber music with cellist Robert Spergel, and cello performance under Marcus Adeney, a former Toronto Symphony cellist. In addition to the Santa Monica Symphony, he has played with The Peterborough Symphony (Peterborough Ont), The Royal Conservatory Orchestra (Toronto, Ont), The University Symphony Orchestra (Chicago, IL), and The Beach Cities Symphony, (Torrance, CA). He also loves playing chamber music.